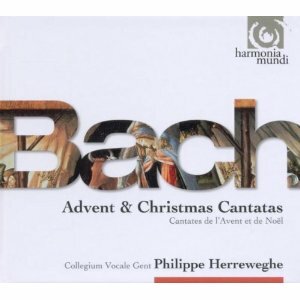 Herreweghe's Bach Cantata recordings are rightly considered milestones in the history of the works on CD. In comparison with his predecessors and contemporaries, he is more a consolidator than an innovator, and his approach builds on the work of Harnoncourt, Leonhardt and Gardiner. Where you might find the occasional extreme tempo of surprising orchestral balance in their recordings, Herreweghe is more interested in holding the interpretive middle ground but ensuring the quality of the performances are at least equal to those of his colleagues, and often far superior. These three discs are devoted to Advent and Christmas Cantatas, three of the former and six of the latter. The most famous of them is the Cantata 'Nun komm, der Heiden Heiland' BWV61, an advent cantata from the composer's Weimar years. If the Christmas Cantatas seem unfairly neglected, that may be because of the dominance of the composer's Christmas Oratorio, but whatever the reason, they certainly deserved to be heard more. When it comes to performers, Herreweghe only works with the best. His orchestra includes some of the biggest names in the period performance movement, and fans of oboist Marcel Ponseele will be pleased to hear that he has a prominent role in many of these cantatas. The vocal soloists also form an impressive lineup. From this side of the channel, the most familiar singers are the gentlemen, the tenors Mark Padmore and Christoph Prégardien, and the bass Peter Kooy. Bach isn't one to push his tenor soloists, apart from in his Passions, and both the tenors are slightly neglected here. Peter Kooj, in contrast, seems to be an almost continuous presence throughout the recordings. His voice is ideal for Herreweghe's approach, his timbre is soft and approachable but always impeccably controlled and his tuning and articulation are impeccable. These recordings were made in 1996, 97 and 2003, and they find Kooy at the peak of his powers. Some of the later Bach cantata recordings he has made with Suzuki find him in poorer voice with an uneven tone, but there is no suggestion of such problems here. Among the female soloists, soprano Dorothee Blotzky-Mields is the most distinctive. Her solos in the BWV 91, 121 and 133 Cantatas are a diverse musical mix, but she has a very distinctive tone and makes each of the recitatives and arias her own. Women's, rather than boys, voices are the standard for Herreweghe recordings, but Blotzky-Mields offers some compensation for those who pine for the cathedral choir sound. Her timbre seems to be somewhere between that of a boy treble and a operatic soprano, which when combined with the clarity of her diction, allows her to make the most of both worlds. The other female vocalists are less distinct but no less distinguished. Sarah Connolly makes an appearance on the Cantata BWV62 (which is also called 'Nun komm, der Heiden Heiland') but only in a recitative that lasts less than a minute, another scandalously underused talent. This release is one of a set of Herreweghe reissues from Harmonia Mundi. Where other labels may be tempted to economise on the packaging of their reissues, Harmonia Mundi have gone in the opposite direction, producing hard-bound booklets with inserts for the discs, full libretti and a good selection of Christmas-themed illustrations, all colour reproductions of Renaissance masterpieces. Herreweghe has been recording with the label since the 80s, and they are justifiably proud of his work. The relationship is about to change though, as Herreweghe is about to set up his own label. The chances are he won't be able to match the high production values of Harmonia Mundi, but thankfully he has signed an agreement that will see HM distributing his discs. Promising times ahead then, for Herreweghe fans, but as these reissues demonstrate, there will always be plenty in his back catalogue worth revisiting.